Teach yourself how to love your body by trying different clothes and finding what works for you and your body to make sure that you feel amazing each time you walk out of your house. Getting dressed on a daily basis can be quite a struggle at times. As much as I have learned to love my body, some times I just don’t know how to dress it. Whether it’s because I don’t understand the trends or I just don’t feel like anything works with my body time, it’s definitely not easy. And don’t even get me started on going shopping. That’s pretty much a nightmare. But I am a complete believer that confidence and self-esteem comes from the way you carry yourself. If you’re not comfortable with what you’re wearing, it’s going to show. You’re going to be pulling at your clothes all day. You’re going to be introverted. It’s just not going to come across as confident. But if you’re dressed in a way that makes you feel good about yourself, no matter your body type, you are going to walk with your head held high and all the confidence in the world. I don’t know why I stopped posting my StichFix findings because the last few had been awesome! Maybe I’ll have to do a re-cap at some point. But before I do that, I thought I’d make you a little video showing you exactly what I got this month instead of taking awkward still shots. 1. Alan French Terry Asymmetrical Zip Cardigan – Market & Spruce – $68 – This one was all sorts of wrong. It was too big. I didn’t know where I was supposed to wear it. I definitely didn’t work for the office, and it was too expensive to just be a “lounge around the house” sort of top. I totally didn’t feel comfortable. Always trying to adjust it. I was really just confused by the piece and had to send it back. 2. Stellan Draped Cardigan – Staccato – $68 – Although this piece is bright and cheerful, I wasn’t sure it was completely flattering to me. I already have 2 very similarly-cut pieces, and I always feel like I’m either swimming in them or trying to hide behind them. As pretty and cute as this one, I just didn’t feel my best in it, so I had to send it back. 3. Braddon Airy Knit V-Neck Sweater – RD Style – $68 – The “periwinkle” color of this sweater isn’t really my favorite. It seems dated, at least for my style. Yes, it was perfect for the season change, but I just wasn’t in love with it. The color, the cut, and the way it made me feel – kind of an overall blah. This one went back in the box. 4. Aleah V-Neck Solid Dolman Sleeve Shirt – Market & Spruce – $48 – I actually really love the cut of this top, but for some reason, it just seemed plain. No color. Nothing wow-ing me. And it kind of bothered me that wearing a cami underneath, every single wrinkle in the cami would show in the shirt. I was always having to adjust it. I know that’s a teeny tiny little thing, but if I’m paying top price, it’s got to be a perfect match for me. So I sent this one back. (not pictured) Danny Knit Pant – Kut from the Kloth – $48 – I liked these pants. They were ridiculously comfortable, almost to a fault because I really just wanted to curl up and be super lazy wearing them. Plus they were about 3 inches too long for my shorter legs. Stitchfix did just announce that they now have a petite line, along with their new maternity line, and I wonder if I need to check that out. It says it’s for those 5’3″ and under and I’m somewhere between 5’3″ and 5’4″ so maybe it would be for me. I’ve just never really considered myself petite. Anyway, these pants did not make the cut either. The entire box got shipped back (totally free! ), which hasn’t happened in months – I’ve been a buying machine with the awesome fixes they’ve been sending me. My bank account needed a break! 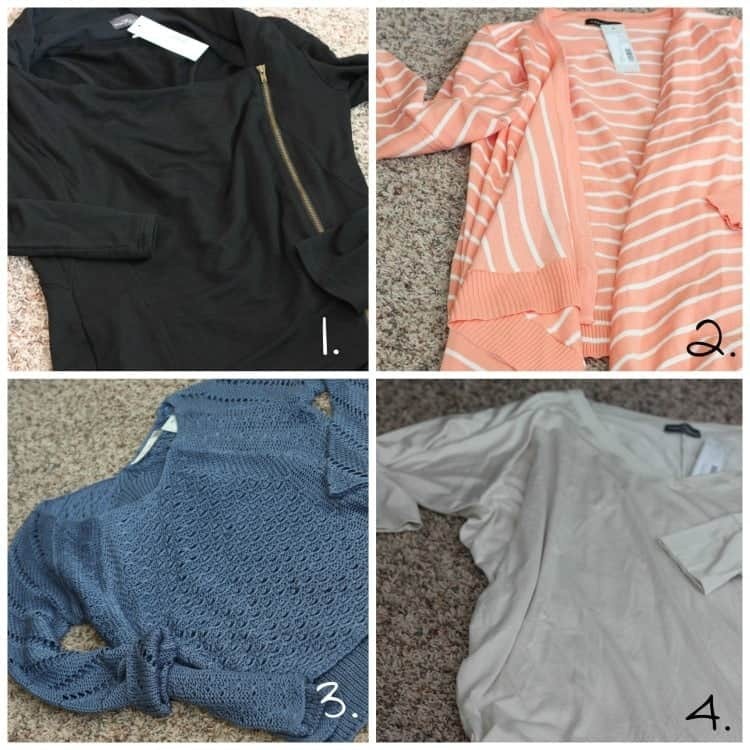 • Using your information sheet as a guide, a StitchFix stylist hand picks five items they think you will like and sends them your way. • Review your items, try everything on, then decide what you want to keep and what you want to send back! Then be sure to give LOTS of feedback on what you liked and didn’t like so your stylist will know what to do next time! Want to try it yourself? Head on over to Stitch-Fix ( <– affiliate link) and schedule your first box!